beautifully designed that it makes you wonder how something so magnificent ever came to be.. 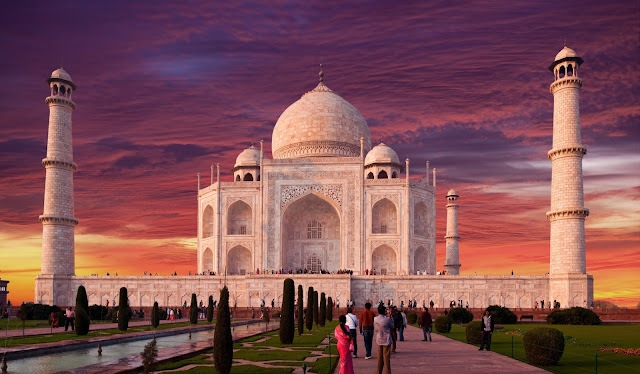 In fact, it was built by the late emperor Shah Jahan in memory of his then late third wife Mumtaz Mahal. He employed over 20,000 workers and spent over 30 million rupees (in 1632, mind you) to complete what is today one of the seven original wonders of the world. In case you’re interested, you can also come across it in Age of Empires: Rise of Nations. A clear exhibition of the stupendous richness of South Indian architecture, this wonderful edifice is a vital element of the important heritage of the region. One of the largest temples in India, the Meenakshi Amman Temple has 12 massive gates, with biggest gates situated on the outer walls. These are known as Gopuram and are a great spectacle. There is a tank inside the premises, besides a hall, known as the hall of thousand pillars, the amazing sculpting on which is beyond compare. Other halls too are adorned with beautiful figures, designs and carvings and are unique from each other. 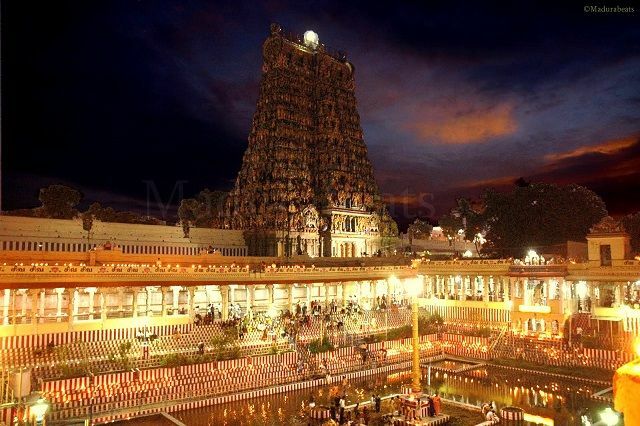 The original temple was reconstructed in the 17th century by the first Nayak king of Madurai, Vishwanath Nayak after it was damaged during Islamic invasion of the region. The temple along with its complex now spreads in an expansive 45 acres space and is a major spot for Hindu devotees and cultural admirers. It is one of the largest rock-cut monastery-temple cave complexes in the world, and a UNESCO World Heritage Site, featuring Buddhist, Hindu and Jain monuments, and artwork, dating from the 600-1000 CE period.Cave 16, in particular, features the largest single monolithic rock excavation in the world, the Kailasha temple, a chariot shaped monument dedicated to Shiva. The Kailasha temple excavation also features the gods, goddesses, and mythologies found in Vaishnavism, Shaktism as well as relief panels summarizing the two major Hindu Epics. There are over 100 caves at the site, all excavated from the basalt cliffs in the Charanandri Hills, 34 of which are open to public.These consist of 12 Buddhist (caves 1–12), 17 Hindu (caves 13–29) and 5 Jain (caves 30–34) caves, with each group representing deities and mythologies that were prevalent in the 1st millennium CE, as well as monasteries of each respective religion. They were built in proximity to one another and illustrate the religious harmony that existed in ancient India. All of the Ellora monuments were built during Hindu dynasties such as the Rashtrakuta dynasty, which constructed part of the Hindu & Buddhist caves, and the Yadava dynasty, which constructed a number of the Jain caves. Funding for the construction of the monuments was provided by royals, traders and the wealthy of the region. The Padmanabhaswamy temple is a historic temple located in Thiruvananthapuram, Kerala. Although its exact date of creation isn’t known, several ancient scriptures from before 800 A.D. have made references to the same. The Temple was built in the classical Kerala and Dravidian style and is in honour of Lord Vishnu, who can be seen reclining on Anantha, the serpent. Sadly, not everyone is allowed into this temple. Only those who profess the Hindu faith are. But if you ever get the chance, take it without thinking twice. Many of you may not recognize this name right away, but if I said Golden Globe in Auroville, would it ring a bell? Matrimandir is an edifice of spiritual significance for those who practice internal yoga or kriya. It took 37 years to build (1971-2008) and was finally made open to the public soon after. It’s a huge golden sphere surrounded by twelve pedestals and its golden discs reflect sunlight off its surface, giving it a sheen of brilliance. Guess Pondicherry isn’t just famous for alcohol, is it? The Pir Panjal Tunnel is a railway tunnel located near the Pir Panjal range in the middle of the Himalayas. What makes it spectacular is that it is the longest railway tunnel that exists in India (11 kilometres long) and the second largest in all of Asia. Indian Railways started the project after growing concerns of safety near the Himalayan region. Trains which pass through this tunnel will now go through 11 kilometres of undisturbed rails. The project is almost complete and is set to kick off soon, although 11 kilometres of darkness doesn’t sound too safe to me either. One of India’s largest over-water bridges, the Bandra-Worli sea link was created to address the traffic congestion between Bandra and Worli in Mumbai. The bridge is 5.6 kms long and cost over $16 billion to construct. It took over 10 years to make and now caters to over 100,000 vehicles. The bridge was inaugurated in 2010 and since then, a drive to Worli from Bandra or vice versa takes only one-third the time (down from 90 minutes to 30 minutes max in peak traffic). At least we’re trying to fix the population crisis right here instead of migrating to everywhere else around the world. I’ve looked all over the place but I just can’t find a more peculiar looking building than I-Flex. Located in the Bangame Tech Park, C.V.Raman Nagar, Bangalore, this building has spiralled to the top of the list of engineering marvels in India. It looks to me like what can only be described as an Aviation Control Tower jetting out in every direction, structured next to a Superbowl like mini-dome. Keep in mind that this is just another regular office building to and from which thousands of people travel to work every day. I don’t know about you but if I had to work there, maybe the building alone might have been a weirdly satisfying motivation. 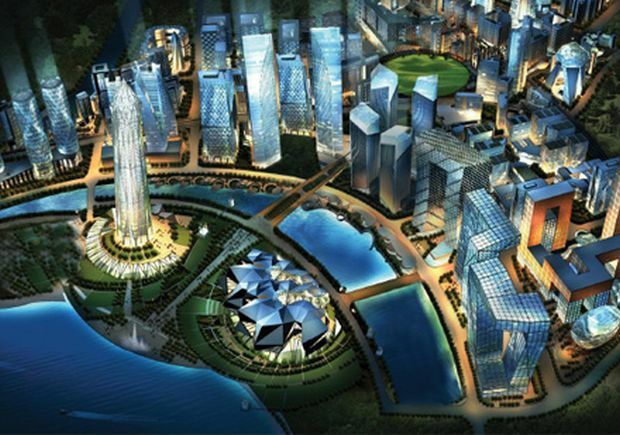 India’s answer to Downtown Dubai (of which Burj Khalifa is a part), Gujarat International Finance Tec-City (GIFT) city is under construction in the Gandhinagar District of Gujarat. A dream of our Prime Minister Narendra Modi, this under-construction GIFT City aims to set up new global benchmarks for Global Integrated City. It will have high quality physical infrastructure, such as electricity, water, gas, roads, district cooling, telecoms and broadband, to lure in finance and tech firms operating in Mumbai, Gurgaon and Bangalore and become the central business hub – not only of India but also for the World. It will include Special Economic Zone (SEZ), international education zone, entertainment zone, international techno park, Software Technology Parks of India, shipping malls, stock exchanges, service units and integrated townships. Setting a new paradigm of Urban Planning, the GIFT City landmarks will include the GIFT Diamond Tower (expected to be completed by 2017), GIFT Gateway Towers which will have a rooftop restaurant and elaborate terrace gardens (inspired by Buland Darwaza), four GIFT Crystal Towers overlooking River Sabarmati, GIFT Convention Centre which will have an opera and a seating capacity of 10,000 people and a World Trade Centre. The sophisticated planning is a test-bed to introduce several reforms and innovations in various fields, including sustainability, environmental protection, infrastructure development, delivery systems etc. The Dhola–Sadiya Bridge, also referred to as the Bhupen Hazarika Setu, is a beam bridge in India, connecting the northeast states of Assam and Arunachal Pradesh.The bridge spans the Lohit River, a major tributary of the Brahmaputra River, from the village of Dhola (Tinsukia District) in the south to Sadiya to the north. The bridge is the first permanent road connection between the northern Assam and eastern Arunachal Pradesh. India’s longest river bridge, capable of withstanding the weight of a 60-tonne battle tank, will be inaugurated in Assam close to the border with China on 26 May by Prime Minister Narendra Modi. 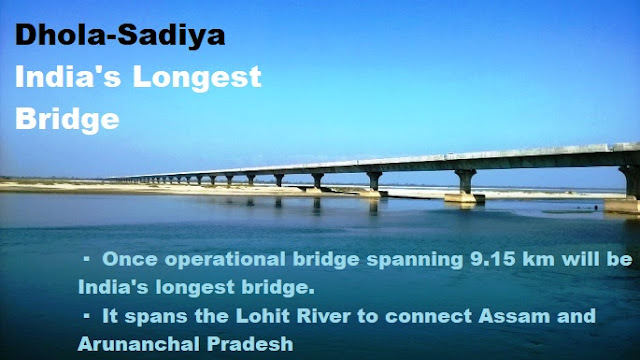 With the inauguration of the 9.15-km-long Dhola-Sadiya bridge over the Brahmaputra river, the prime minister will kick start the celebrations of the NDA government’s three years in office from this eastern-most part of Assam. The bridge is seen as an attempt by India to shore up its defence requirements along the Sino-Indian border particularly in the Northeast besides providing easy access to the people of Arunachal Pradesh and Assam with air and rail connectivity. It is 3.55 km longer than the Bandra-Worli sea link in Mumbai, making it the longest bridge in India. “The prime minister will dedicate the strategically important bridge to the nation on 26 May. It will bolster the road connectivity in the Northeast as the bridge will be used by people of Assam and Arunachal Pradesh besides defence forces extensively,” Assam Chief Minister Sarbananda Sonowal told PTI. The construction of the bridge began in 2011 at a project cost of Rs950 crore. The design is such that the bridge can withstand the movement of military tanks. “Assam and Arunachal Pradesh have huge strategic value to the country. Since the bridge is located close to our border with China, it will help quick movement of military troops and artillery in times of conflict,” Sonowal said. The bridge is located 540-km away from Assam capital Dispur and 300 km away from Arunachal Pradesh capital Itanagar. The aerial distance to the Chinese border is less than 100 km. After Kaliabhomora bridge near Tezpur, there is no bridge over the Brahmaputra for the next 375 km upstream till Dhola, where the new bridge is constructed. Currently, all the transport between the two banks of the river are being carried out through water only. The bridge, when opened for the public, will cut down the travel time between Assam and Arunachal Pradesh by as much as four hours. As there is no civilian airport in Arunachal Pradesh, this bridge will help people of the state to reach the nearest rail head in Tinsukia and the airport in Dibrugarh easily. Sonowal said the delayed works of the bridge was expedited after Modi assumed the charge in 2014. The bridge was originally scheduled to open in 2015. The BJP government in Assam will complete one year in office on May 24. The bridge is one of the key projects of the ministry of road transport and highways in the Northeast and is built in public-private partnership with a construction company. If you like this post, plz share it with your friends, and in case if we have missed some important one, do care to share below in the comment box.